Bara’m, means “buds” in Arabic, hence indicating the young generation to carry on the tradition. The group was established by El-Funoun in 1986 to promote Palestinian-Arab cultural identity and to counter the marginalization and alienation of Palestinian children and youth through music and dance expression. Members of Bara’em, who are mainly recruited from Ramallah and Al-Bireh area, are all volunteers who are committed to the group’s mission. 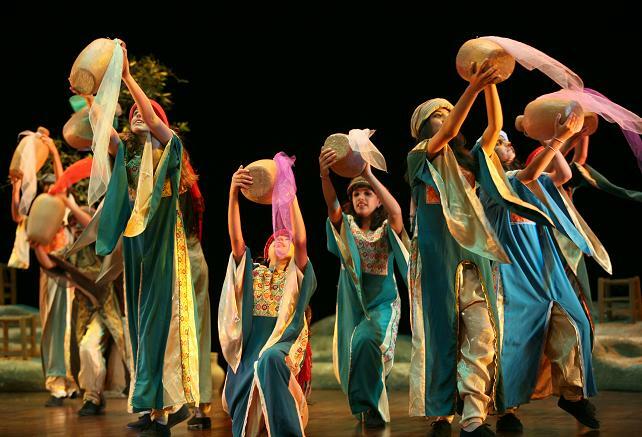 They are the future of El-Funoun dancers guaranteeing the Troupe’s continuity and artistic excellence. Comprising of 42 dancers (both females and males) ages 9 – 18, the dancers are carefully selected by El-Funoun choreographers according to their artistic talent and promising devotion to learn and develop. They are trained by El-Funoun on its main dances and on various dance forms. Bare’em El-Funoun is considered today the incubator where members express themselves, and seek to develop intellectually, and artistically. They are exposed to various learning and sharing experiences through dance; this contributes to their building efficient, aware and initiating positive character in their own communities at their schools and families. Bara’em El-Funoun provokes their innovative skills in addition to enhancing their awareness to their national and cultural identity. Moreover, they participate in the overall cultural development of Palestinian society by presenting dances that express hope, resilience, challenge to oppression, and stereotypes. It performs dances (choreographed by El-Funoun) that are inspired by dabke (Palestinian-Arab folk dance), yet are reflective of the present life of Palestinians. Bara’em won the prestigious First Prize in the 1999 Children’s Dabke Festival, organized by the Palestinian Ministry of Culture.